A beautiful back garden can really alter the ambience of a property. There are a lot of things you can do in the back garden too, from hosting your own BBQ party to sitting back and watching the stars in the evening. There is no need to spend a fortune to get the dream backyard you have always wanted. These 3 tips and tricks will help you jazz up your backyard without breaking the bank. Let’s look into them, shall we? Mood lighting is useful not just for creating a certain ambience indoors, but also for spicing up the way your backyard looks – and feels – in the evening. A spot of light in the right area around the garden can also introduce more warmth and make the space look bigger than it really is. Adding mood lighting to the garden is also a lot easier to do today. You now have plenty of LED lights and solar-powered solutions that you can install easily. Outdoor-specific cables and fixtures are also widely available. If you do want to add mood lighting to the backyard, make sure you keep balance in mind. You don’t want the space to be overly bright at night. Instead of adding big and bright lights, try using smaller, vintage LED filament bulbs instead. This type of bulbs work really well for setting the mood in any space, including your back garden. 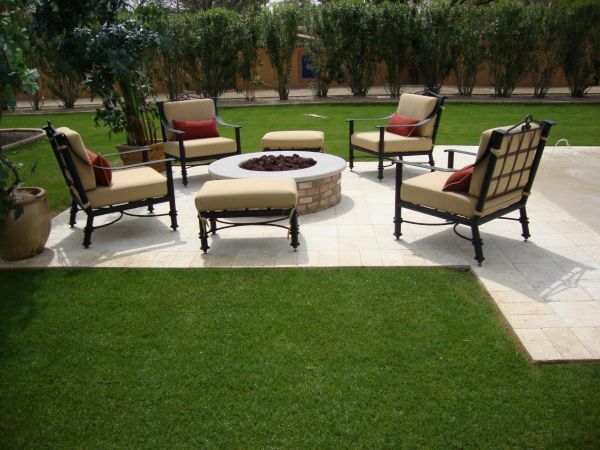 Sticking with warmth as the main goal, another thing you can do is add a fire pit to the backyard. Aside from a permanent fire pit, there are also portable ones that you can store in the shed when you’re not using it. Adding a fire pit requires a bit more planning. First of all, you need to find an area in the garden that you can clear from trees and other plants. Make sure you leave enough space around the fire pit too; reinforcing the centre of the fire pit with dirt or concrete is another good idea to consider. The fire pit itself is made from copper or other metal. As mentioned earlier, you can opt for a more permanent design or use a portable one – with a set of legs and a cover – for added flexibility. Spending the evening in the garden will feel so much better with the fire pit in place. Adding a pergola isn’t a garden improvement that many homeowners consider due to its seemingly expensive cost, but you’ll be surprised by how affordable pergolas and Bali huts are today. There are more designs to choose from, and you can find these pergola designs now with the help of suppliers such as Aarons Outdoor Living. The installation is also relatively quick and effortless. Modern pergolas are pre-fabricated with immense precision to make installing one an easy task to complete. As long as you have the space in the backyard, you can have a beautiful pergola in no time. With these new elements added to the backyard, you will have a more functional and beautiful garden for sure. For more tips and tricks on how to jazz up your garden – and other parts of the house – be sure to stay tuned right here on this site.